From Hosanna! to Crucify Him! Dear crowd crying Hosanna: grace, mercy, and peace to you from God the Father and our Lord and Saviour Jesus Christ. Amen. What a stark contrast between Jesus’ triumphal entry on Palm Sunday and His death on Good Friday. The shouts of “Hosanna!” are replaced with shouts of “Crucify Him!” Praise is replaced with mockery. The shouts of blessing to the King of Israel are replaced with a mocking inscription on the cross, “The King of the Jews”, indicating the charge against Him. But don’t get this wrong – Jesus chose the mocking over the praise. He chose the shouts of “Crucify!” over the shouts of “Hosanna!” He chose death over life. Jesus chose to be forsaken by the crowds, His disciples, and even God the Father. He did this for us. Because if we examine our lives, we will find and recognize that they are entirely vain and profane. Vain and useless are our many actions. Even more vain are our words. Still even more vain than these are our thoughts. Our lives are not only vain, but also profane and immoral. We can find nothing good in them. Even if something in our lives appears good, it is certainly not good and perfect, because our lives are corrupted by the infection of original sin and the sinful nature. The prophet Isaiah writes, “All our righteous deeds are like filthy rags” (Isaiah 64:6). If our righteous deeds are such, of what kind, may I ask, are our unrighteous deeds? The Saviour says, “If you have done everything that has been commanded you, you are to say, ‘We are unworthy servants’” (Luke 17:10). If we are worthless when we obey, we will certainly be abominable when we disobey. If we owe a debt to the holy Lord God when we do something that is not a sin, what will we be able to offer Him as payment when we do sin? Even more, we pray with the Psalmist, “What man can even recognize all of his offenses? Cleanse me from my secret sins, Lord” (Psalm 19:13). We do not dare to lift up our eyes to heaven because we have offended Him who lives there (Luke 18:13). Nor can we find refuge on earth. How indeed have we dared to hope for favour from creation when we have offended the Lord of creation? So our consciences accuse us. The devil accuses us. But that’s not all. The very voice of God Himself, namely, the divine Law, accuses us. Either the divine Law must be fulfilled or we are going to perish. However, since it is impossible for us to fulfil this, we deserve to perish in an unbearable eternity. God, whom we are unable to deceive, the most severe judge and the most powerful executioner of his own eternal Law, accuses us. He is wisdom itself. From Him we are unable to flee. He certainly powerfully reigns everywhere. To where then can we flee (Psalm 139:7)? To Christ, our sole Redeemer and Saviour, we can flee. Great are our debts, but greater is His payment. Great is our unrighteousness, but greater is His righteousness. In us there is nothing except damnable sin. In Jesus there is nothing except saving merit. We have committed many things on account of which we are most rightly deserving of damnation. Jesus, however, has not left anything undone by which He may mercifully save us. Our sins cry to heaven, but Jesus’ blood shed for our sins cries louder (Hebrews 12:24). Our sins are persuasive so that our hearts ought to be accused by God, but Jesus’ passion in our stead is more persuasive, so that we will be defended. Our unrighteous life is powerful enough that we ought to be damned, but Jesus’ righteous life is more powerful, so that we will be saved. We appeal to the throne of mercy, in order that we may not come into the condemnation that we justly deserve. This is on account of Jesus’ most holy merit, which has been placed between us and condemnation. Jesus covers our sin. He forgives our sin. Jesus is the payment for our sin. That’s why He chose mockery over praise and the shouts of “Crucify!” over the shouts of “Hosanna!” He chose His own death over our death. He was forsaken by God the Father so that we will never be. Jesus chose the agony of Good Friday so that we will have a triumphal entry into eternity when we die from this life. All glory, laud, and honour to our Saviour who died so that we might live. Hosanna! Blessed is He who comes in the name of the Lord. Amen. Portions of this sermon are modified from Johann Gerhard’s Sacred Meditations, I. Concerning true knowledge of sin translated by Wade Johnston. Dear people looking to the cross: grace, mercy, and peace to you from God the Father, and our Lord and Saviour Jesus Christ. Amen. God instructed Moses to put a serpent on a pole and lift it up for all to see. “Look at the bronze serpent and live,” he told them. Anyone who was bit by a serpent, if he would look at the bronze serpent, then he would live. Really? That’s it? Look at the serpent lifted up on the pole? That doesn’t seem like enough. How will looking upon a serpent that isn’t even real heal the poison of the real snake which has bitten? How can the poison pulsing through their veins be removed by merely looking at this raised serpent? Of course it was not the looking that removed the poison. It was not the gazing that healed the bites of the fiery serpents. God’s promise removed the poison. God’s promise healed. Despite the fact that His people had again sinned against Him, God had mercy on them. He gave them the promise of healing. He gave them the promise that He would remove their poisonous infection. God gave them this promise through the serpent lifted up on a pole. In our Gospel reading we heard Jesus say, “As Moses lifted up the serpent in the wilderness, so must the Son of Man be lifted up, that whoever believes in him may have eternal life. For God so loved the world, that he gave his only Son, that whoever believes in him should not perish but have eternal life.” For God so loved the world. Not just part of the world. Not just some certain special people; the whole world. God loved the whole world, so that He sent His Son to die for the sins of the whole world. Jesus died for the sins of every single person. Jesus died for every single sin. As the Israelites looked to the bronze serpent lifted up on a pole, so we look to Jesus lifted up on the cross. No one who looks upon Him will perish. All those who have a bad conscience or are tormented by sin and death can look to Jesus for eternal life. Really? That’s it? Look to a body hung on a cross? That doesn’t seem like enough. How will looking upon a dead body heal the poison of the real sin which has bitten me? 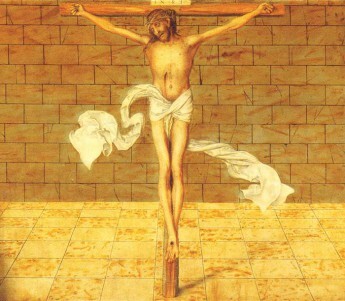 How can the poison of sin pulsing through my veins be removed by merely looking at a raised crucifix? Neither the poison of sin nor death will harm us. We will not perish but will live eternally. This promise is for the whole world. But many love the darkness rather than the light. In our Gospel reading we heard Jesus say, “And this is the judgment: the light has come into the world, and people loved the darkness rather than the light because their deeds were evil. For everyone who does wicked things hates the light and does not come to the light, lest his deeds should be exposed.” They don’t want their evil deeds exposed, so they don’t come to Jesus, who is the light of the world (Jn. 8:12). They prefer the darkness of their sins. This is the reason the world hates the true Church of God – because their deeds are evil. The world hates the Word of God shining light on their works of evil. The world doesn’t hate false churches. Those churches that give approval to the world’s deeds of darkness are praised. The churches that cave to the pressures of society and give their blessing to every imaginable sin are not the true Church. They are not in the light but are in the darkness of sin. They’ve been bitten by the poison of sin but refuse to look at the cross because they won’t admit that their poisoned. They prefer the darkness to the light; the poison of sin to forgiveness. It is God’s work that we are saved. It has nothing to do with our works. It is a gift of God. We cannot boast about anything. We cannot elevate ourselves above those who are in darkness, for we have been saved from that same darkness of sin as a gift. We have been brought out of darkness to His marvellous light. Now neither the poison of sin nor death will harm us. We will not perish but will live eternally. This is God’s promise to us. God’s promise is why we look to the cross. Because where has the poison of your sins gone? There to the cross! Where are your sins? There on Jesus. Where is your death? There on the cross! Where is the punishment for your sins? There on the cross! Every single one of your sins is right there! How can you be sure? Well, Jesus died for the sins of the whole world. Are you in the world? Then your sins are there on the cross, and His forgiveness is for you. It is not your own doing. It is a gift. And God gives you this gift again today in His Word of promise, and in the body and blood of Jesus. The Lord’s Supper has been called the medicine or immortality because it gives eternal life. The Lord’s Supper is the cure for the bite of sin. The Lord’s Supper is the antidote to the poison of sin pulsing through our veins. Everything accomplished on the cross is given to you at the Lord’s Altar. This is God’s promise. God’s promise removes the poison of sin. God’s promise heals. So look to the cross, and come receive your gift. Amen. Dear cleansed church of God: grace, mercy , and peace to you from God the Father and our Lord and Saviour Jesus Christ. Amen. Is what we do in this church building really that important? The little things that we do or don’t do; the events we allow to take place here; the hymns we sing here; the posters we put up in the narthex? Is it an overreaction if we refuse to advertise or host certain events? Is it an overreaction to say that we should not do certain things in this church building? The meek and mild Jesus thinks such things are important. The sweet and tender-hearted Saviour who will not break a bruised reed or quench a faintly burning wick (Is. 42:3) made a whip of cords and thrashed people in the Temple! He kicked over tables and scattered their stacks of coins. Jesus cast out these traders with more fervour than He cast out demons. Clearly, some practice that was taking place in the Temple was serious enough to warrant such a strong reaction. What was so wrong with what was going on in the Temple? Traders were there selling animals so that God’s people could offer the sacrifices prescribed by the Law of God. This way the people who made their pilgrimage to the Temple from far away wouldn’t need to make the long trek with animals in tow. The animals were necessary for the prescribed sacrifices. The money-changers were also necessary. Every Israelite twenty years old and upward was to pay the Temple tax and it had to be paid in Jewish coins (Ex. 30:11-16; cf. Mt. 17:24-27). Money-changers exchanged Roman coins with the Jewish currency. The Roman coins had the image of Caesar and an inscription declaring him to be a god. The money-changers exchanged these idolatrous and blasphemous coins for Jewish coins, the local currency that was acceptable for the Temple tax. The problem wasn’t the smell or mess of the animals either. The animals were supposed to be brought to the Temple for sacrifice. The problem wasn’t high prices or bad exchange rates. Jesus says nothing concerning false balances; only that His Father’s house is not to be made a house of trade. Despite the need to have animals for sacrifices and local coin for offerings, the Temple was not the place for such transactions. The Temple was not for commerce or trade; the Temple was not for buying or selling. The Temple was the place of forgiveness. It was the place where the Ten Commandments were covered by the blood of sacrifice; the place where the sins of the people were covered by sacrificial blood. It was where the Ark of the Covenant was, where God was enthroned above the cherubim. The Temple was to be a sanctuary from the outside world; a sanctuary from buying and selling. The Temple was the house of God, not a house of trade; the place of forgiveness, not a place of defiling mammon. This place of forgiveness had been turned into a house of trade. The place of prayer had been turned into a place of commerce. The sanctuary from the outside world had the world invading inside of it. The sanctuary of forgiveness had become a place for raising money. The purpose of the Temple was forgiveness. Anything that interferes with forgiveness cannot be tolerated – even if that something is a necessity. Yes, it was necessary to have animals for sacrifices and money-changers for offerings. But these did not belong in the Temple. These things interfered with the forgiveness of sins that God distributed in the Temple. Today, the purpose of the church is forgiveness. Anything that interferes with forgiveness cannot be tolerated. This means that we also need to ask ourselves some tough questions. Are we doing things that interfere with or obscure the Gospel? Anything that obscures the Gospel – whether a bazaar, a tea and bake sale, or a poor hymn – cannot be tolerated. Nothing can interfere with the free forgiveness of sins distributed here. There are not always easy answers to these questions. What we must ask is what are we saying by what we do? If a visitor comes to an event, what impression are we giving to them about the church? That it is just another place to buy and sell or have a cup of coffee? That we are just another institution looking for their money? That any money given to the church earns them some kind of brownie points with God? We have become convinced that just because the cause is good, the event belongs in the church. Churches have become places of trade. If you are hungry, you can buy some baked goods. Looking to invest money? Invest in the Church Extension Fund. Want entertainment? Come watch a play, attend the bazaar, or listen to a concert. Like I said, there are not always easy answers to these questions. But we must always ask ourselves what the purpose is of any event or anything we do. Are these things making us appear to be just another place to buy and sell; another place looking for money? Then we must not tolerate them. Are these things interfering with the forgiveness of sins given here freely? Then by all means we must cast such things out. Do we not have enough places of buying and selling without invading the place that should be sacred because it is dedicated to God? However, when opportunities arise to host events that serve the Gospel, this is a different matter altogether. When we can invite others here to tell them about the forgiveness of sins earned for them by Jesus; when we can host a cantata that isn’t just entertainment but proclaims the death and resurrection of our Lord; when we can serve others in Christians love and hospitality – then such events belong in the church. In discussing all of this, we must keep in mind why Jesus cleansed the Temple. In casting out the traders and money-changers, Jesus does not reveal anger, but jealous love. Anger would have consumed the traders and money-changers, but Jesus doesn’t consume them, He simply casts them out of the Temple. Jesus is jealous for those He cast out and for all the people coming to the Temple. He wants to give them forgiveness and doesn’t want anything to interfere with that forgiveness. Instead of consuming them, Jesus Himself was consumed. The disciples remembered the Psalm which prophesies concerning Jesus, “Zeal for your house will consume me.” (Ps. 69:9) This zeal of cleansing God’s house of anything that gets in the way of forgiveness did indeed consume Jesus. He was consumed completely. Jesus was consumed by the wrath of God on the cross for our uncleanness. The Lord laid on him the iniquity and uncleanness of us all (Is. 53:6). Jesus died to cleanse the church. His casting out of the traders and money-changers didn’t cleanse His Father’s house even though He did it a second time during Holy Week. It took His blood to cover their sins. It took His blood to cover our sins. It too Jesus’ death to cleanse the church. The church is the place of forgiveness. It is the place where the Ten Commandments are covered by the blood of sacrifice; the place where our sins are covered by the blood of Jesus. It is the place where Jesus is with us and gives us His forgiveness. Jesus cleansed the Temple by being consumed by the wrath of God. Jesus cleansed the church by being consumed by the wrath of God. And we receive that cleansing when we consume Jesus. Sacrifices from the Temple were eaten for the forgiveness of sins. In the New Testament era, Jesus gives us His very body and blood which was sacrificed for us to eat and drink. By consuming His body and blood, we are cleansed. We receive forgiveness in this sanctuary from the outside world. It cannot be bought or sold. It is given freely. Jesus is consumed with zeal to cleanse us. He doesn’t want anything interfering with His forgiveness to us. His forgiveness is free, without any merit or worthiness in us. His forgiveness is never ending, and He gives this forgiveness in His Church, the sanctuary from the outside world. He gives us forgiveness in this, His Father’s house, which He has cleansed with His own blood. Amen.